For folks who are not project-oriented, you might be wondering what steps led up to the building of the outdoor shower. How’d I go from, “hey – an outdoor shower would be nifty” to “whoa – I have a great looking outdoor shower in my backyard”? May 2013: My outdoor shower at my property, Dolce Verde. You’ve seen the beginning of the outdoor shower/shade house project. Now let’s take a look both backwards and forwards in time to find out how it came into being. My original final design project of my property submitted for my first Permaculture Design Certificate back in 2007. My instructor was Don Titmus of Four Directions Permaculture. This is the overlay of shade structure that I envisioned covering much of my roof. The final shade house was much more modest in scope. In the beginning, there were thoughts of greywater, a shade house and chickens designed by a brand new Permaculture Design student; her certificate newly minted. 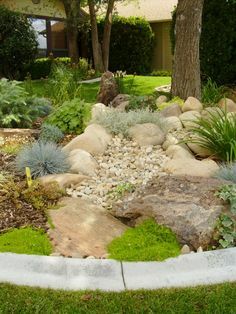 What was a dream in December of 2007 quickly became a reality when I had the opportunity to host Brad Lancaster, water harvesting guru, at my home in May of 2008 to do a workshop on installing an outdoor shower for the Valley Permaculture Alliance. I came to be chosen for this project because I had done a lot of volunteer work for the VPA, building out their social media site and getting over 100 classes up and running. 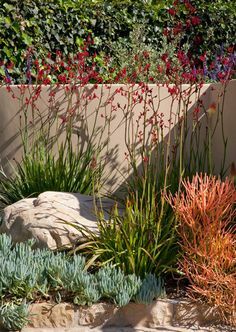 Brad took a look at my original plan and helped me refine it, giving me more insight into what the greywater budget would be for my shower and what types of plants I might consider growing with the water. The final plan included a shower with three drains, each feeding an infiltration pit. Two pits held grapevines and the third originally held an artichoke. 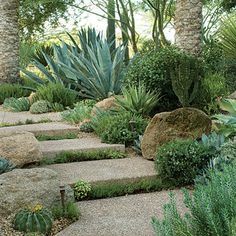 Later it became self-evident that the artichoke basin was getting more water and could support a Chinese elm tree that will ultimately shade the shower, henyard and raised patio area, providing relief during our long, hot summers. August 2008: The shower is functional but the infiltration pit is not planted yet. Once the plan was revised to everyone’s satisfaction, we invited participants to the actual build out. 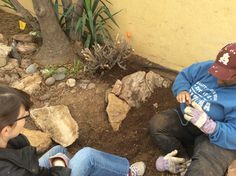 About 25-30 people showed up that day to help out and I think it was an eye-opening experience for all of us to see the possibilities of using greywater in our arid landscapes – I know it was for me. Brad also talked about the importance of using the right soap for greywater landscape use and I took his advice and use Oasis Dishwashing soap for hands and body and Aubrey Organics brand shampoos for hair. November 2008: The infiltration pit is planted with a couple of artichokes and the henyard and compost bins are complete. 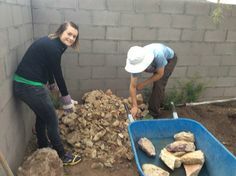 It’s interesting to note that several of the participants in that class were so inspired that they went on to work with water harvesting in some way – either by selling materials, as designers, or in the case of Ryan Wood, by becoming the Program Coordinator for the Phoenix branch of Watershed Management Group; a very effective non-profit dedicated to water harvesting in drylands. Watershed Management Group has taken the concept of the barn raising model to design and build water harvesting projects to a whole new level with their Green Living Co-op program. 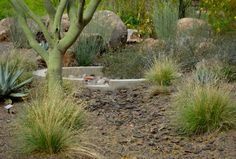 This program allows you to earn hours towards hosting a water harvesting installation at your house by working to help others with their projects. 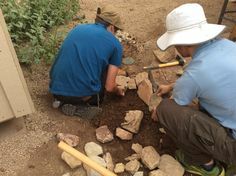 If you live in Phoenix or Tucson, I highly recommend signing up for this free program and attending local workshops – the education you receive by actually participating in the build is amazing. May 2008: The basic work of installing the infiltration pits and the mockup of the shower platform with drains was accomplished during the workshop. All this is now hidden by plants and the shade house structure. June 2012: Thompson grapes growing over the top of my shower. You can see bunches hanging down against the wire. They also grow across the top of the shower and hang down into the shower proper. I can eat grapes while I get clean! Interestingly, that particular grape has no direct water to it – it survives by sharing the water vented to the Chinese elm. So you can see, plans change over time. My more extensive shade structure was limited to just the shade house on the back (east-facing) side of the house. Monitoring the greywater flow to the various infiltration basins indicated that I could swap out a lower water use, seasonal shrub (artichoke) for a large shade tree that will save me some money on my air conditioning bills. It’s a learning process and there are always little tweaks to the system that will let you obtain a greater yield. 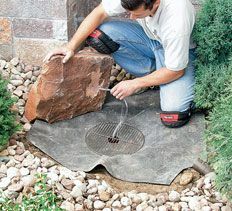 Posted in Greywater, Water Harvesting. Tags: dolce verde, greywater, water harvesting on November 4, 2013 by Jennifer. I've been thinking about an outdoor shower too. Could you share some more details on how it is plumbed? I LOVE my outdoor shower. I connected both the hot and cold water from my house to the shower (it does get cold here in Phoenix in the winter), which allows me to use it all year long. In other words, I'm using municipal water, not stored rainwater from a tank or anything. 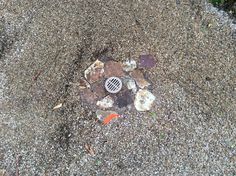 For the greywater leaving the shower, there are three drains that gravity feed (1/4" drop per linear foot) to three separate infiltration basins (see part 1 of this blog). I can control which basin gets the water by covering the other two drains, then swap them around the next time someone takes a shower. Thanks, Jen! After reading this... I think we're going to reconsider the way we've designed our outdoor shower. Right now it just has a deep rock pit underneath but I think we'll pour concrete and install a drain instead and use the gray water for a couple of trees. Your shower looks like a wonderful project - I'm thinking of doing something similar. I have 2 questions: 1) how did you run the hot water from the house to the shower: did you bring the copper hot water pipe out through the wall of the house and then run copper pipe (or PEX?) underground to the shower? 2) How did you get the slope of the concrete floor right so that water flows to the drains? Was it difficult to do? I looooove my outdoor shower. You will love yours too! 1) I did run copper pipe but did not have to cut into any walls as my hot water heater is actually outside. 2) Chip Satterlund, permie handydude, did the cement work and the plumbing. I watched him do the drains and basically he just gently sloped (2% grade) the cement towards the area of the three drains. The hardest part is was right around the middle drain. If you are in the Phoenix area you can contact Chip at chipsatt @ cox dot net.